If you wish to learn driving, join us at Dhoot Driving School in Surrey Quays, London since we offer world class and state of the art, driving training programs like B + E car and trailer training, refresher training courses, LGV (HGV) training, PCV training and driver CPC training. The driving programs would not only help beginners to become skilled and professional drivers but experienced drivers too can upgrade their skills at Dhoot Driving School. The advantages of joining Dhoot Driving School for driving training programs are many. The biggest advantage we offer is a stress free and safe environment for you to learn driving since we take all the responsibility if turning you into a safe, skilled and knowledgeable driver. If you are worried about the language since you are not a native English speaker or do not understand English at all, we have a solution for you. Our trainers are experts in multiple languages apart from being approved driving instructors whoa re also registered with the DSA or driving standard agency. The trainers at Dhoot Driving School would instruct you in a language that you are comfortable in. the theory books provided are also in multiple languages such that you do not have any problem with the theory parts of your driving training either. All the training programs at Dhoot Driving School are a combination of theoretical education along with practical training. This is since driving is not only about practically handling a vehicle but also about knowing the safety rules and the traffic laws of the roads. For instance you should be aware that the kind of vehicle you drive would depend on your age and the vehicle you drive should not only be legal but should also be safe for the roads. This is for your own safety as well as for the safety of other people on the roads. The various training programs offered by us each have subcategories and as per the subcategory you choose you would not only be trained to drive that particular vehicle but also all about driving that vehicle theoretically. For instance PCV training is for driving passenger carrying vehicles and the subcategories are D1 minibus, D1 + E minibus & trailer, D automatic bus, D manual coach and D + E coach & trailer. You must know that you cannot just choose a particular subcategory since there are factors that contribute to your choice. The factors are the number of passenger you would be carrying in the vehicle and the kind of PCV you would be driving. If you wish to drive a manual PCV you would need D automatic bus or D1 minibus. If you want to drive automatic PCV, you can choose any of the others. Similarly, LGV (HGV) training is meant for driving large good vehicles and heavy goods vehicles. The subcategories offered in this training program are C1 â€“ license, C1 + E – license, C1 + E â€“ 7.5t & trailer, C â€“ up to 32 tons and C + E truck & trailer. The amount of weight you would be able to carry in your vehicle and the kind of vehicle you would like to drive would decide on the subcategory that would be best suited for you. For driving articulated vehicles you would require the C1 + E license and you can choose any of the others for driving rigid goods vehicles. Since it is not easy to drive LGV and HGV, to drive professionally you would need to undergo another training program, CPC driver training. Among the many driver CPC modules, to pass your CPC theory test you would need to qualify for driver CPC modules 4 and 2. 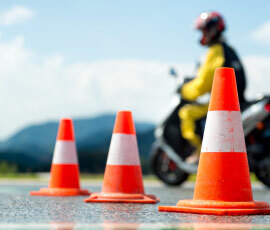 These two modules consist of a practical driving test and a CPC case study. Apart from this you would also need to undergo a periodic 35 hours of training for every 5 years such that you can drive your LGV or HGV professionally. There is also a training program to drive towing vehicles and that is the B + E car and trailer training. There are only two subcategories in this training program and depending on the weight your vehicle would be able to tow you have to either opt for a B license or a B + E license. Dhoot Driving School also helps you in all kind of documentations like filling the D2 and D4 forms and for submitting the forms to DVLA. 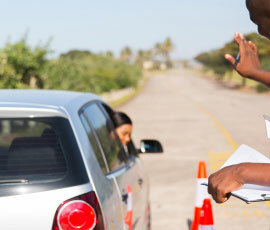 If you are worried about failing your driving test, we have a solution for that too. PCV pass protection and pass protection offers you the chance of reappearing for a driving retest if you fail to clear your driving test at the first go. There are more such services that we offer at GO training and hence if you want to know more please visit us at Dhoot Driving School in Surrey Quays, London.